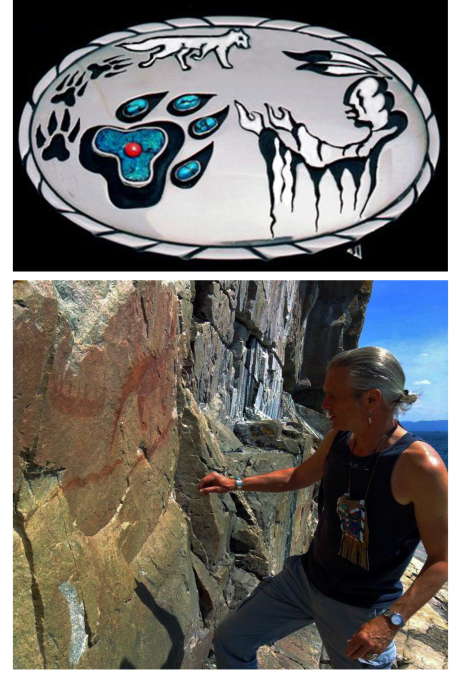 Native Woodland artist Zhaawano Giizhik presents to you with a grateful heart his art project named ZhaawanArt Fisher Star, a venture of unbound Love, Vision, and Creativity in the ancient and sacred tradition of the Anishinaabe and Cree storytellers. 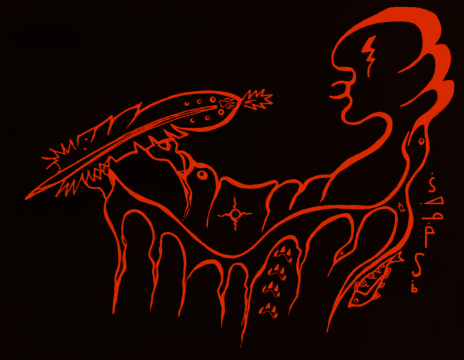 The traditional, allegorical narrative of the Fisher Star, Zhaawano's favorite tale, runs through his blood and his works of art. 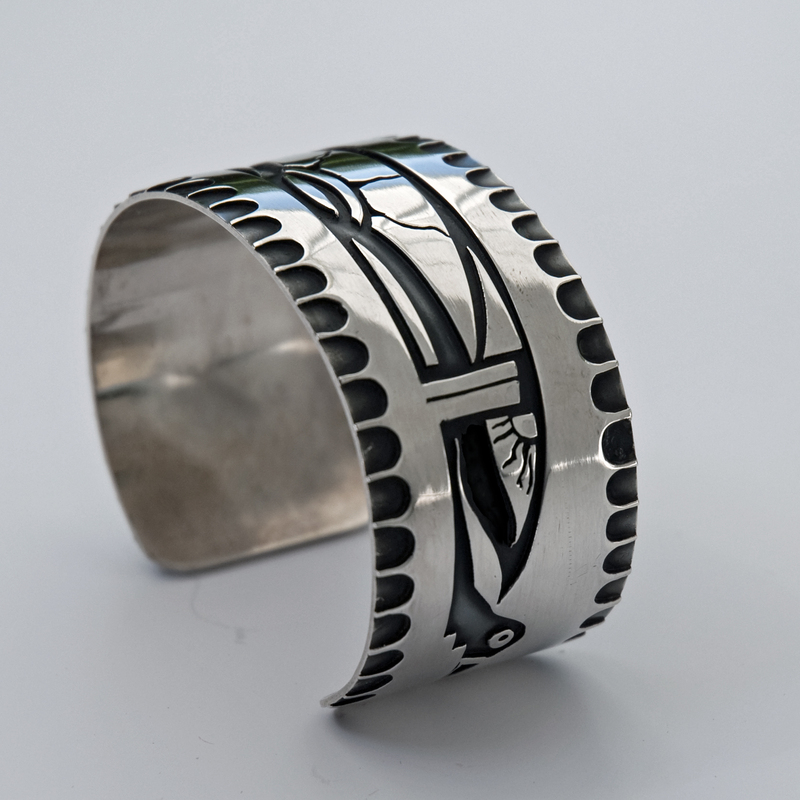 Not only does Zhaawano offer you as a jewelry artist and storyteller at heart an exciting variety of exclusive handcrafted jewelry and wedding and clan rings; on occasion he uses his website as a platform for showcasing poetry and fine art by himself and by kindred Anishinaabe artists who draw from the same cultural and artistic source as he does. 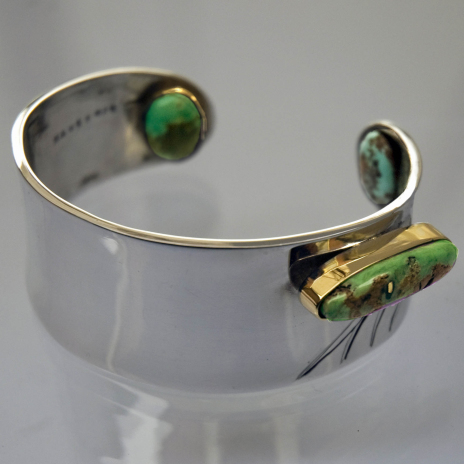 Please view your favorite menus by clicking the links in the vertical top menu bar - or, if you are using a cell/smart phone, the navigation button at the top of your screen. 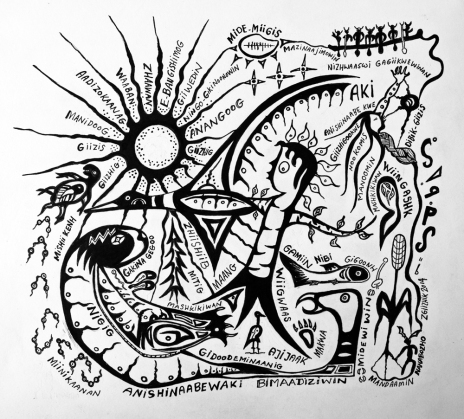 The visions, dreams, and adventures of the Great Storyteller Hero Wiinabozho fill the minds of children sitting spellbound as they listen to Grandfather's stories...Read Zhaawano Giizhik's amazing story of Wiinabozho and the Storytellers' Mirror. 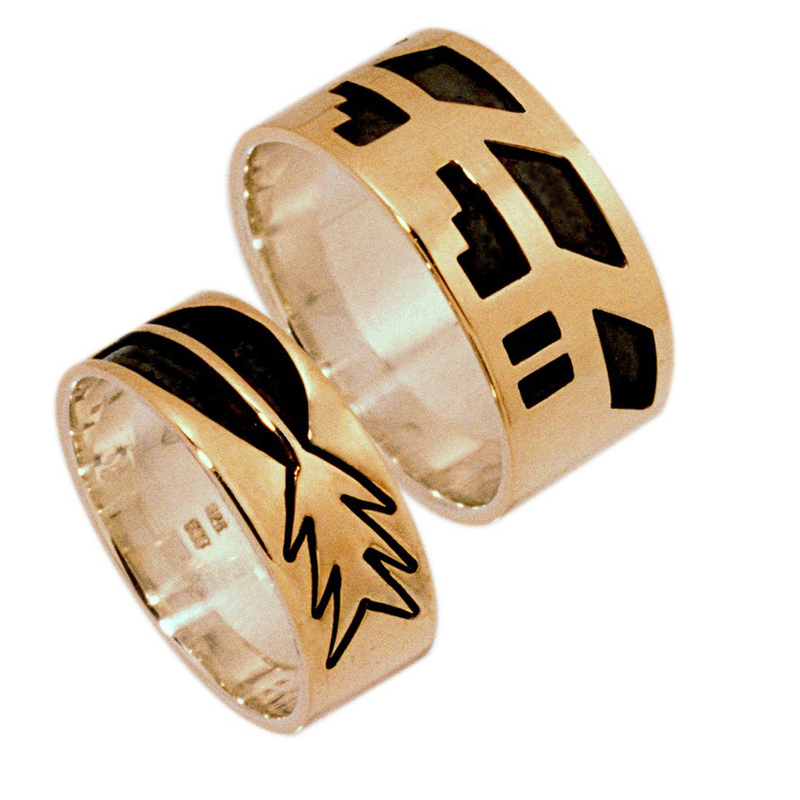 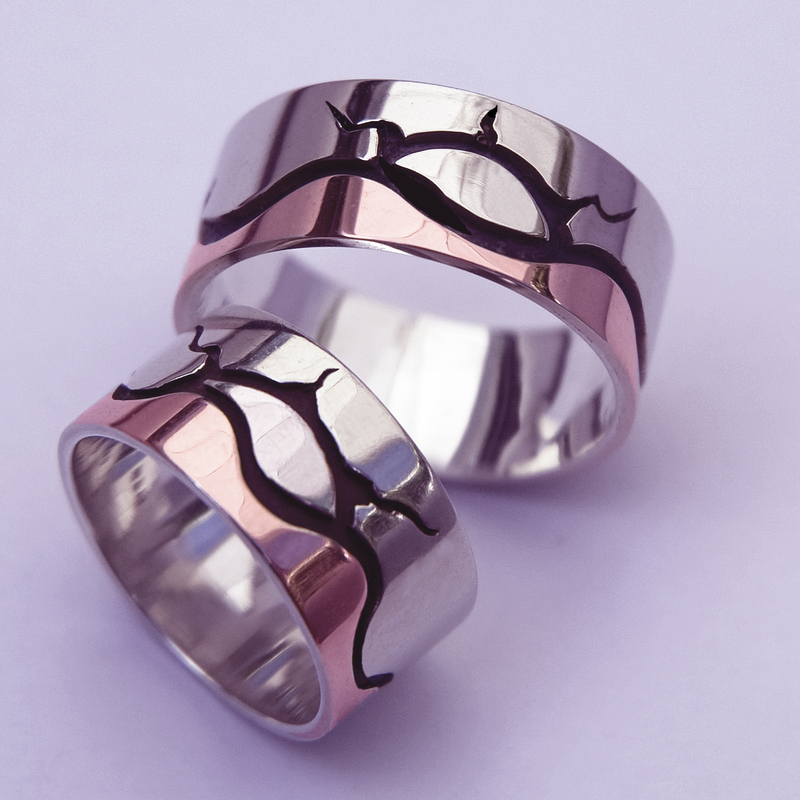 Oshkiwaaseyaaban (First Light of Dawn): these one-of-a-kind wedding rings, which Zhaawano crafted by hand from 14K white over 14 white gold and inlaid with a straight-lined, sleekly stylized eagle feather symbol, also of white gold, testify to the beauty of the overlay technique. 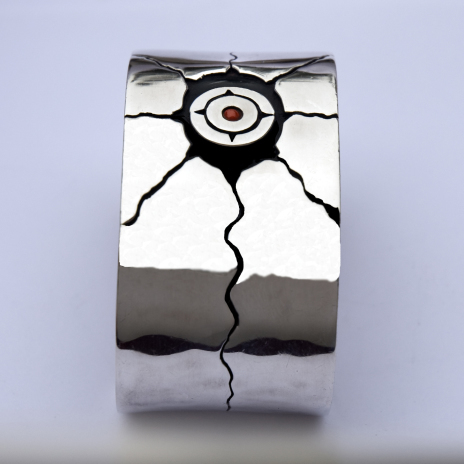 Please click the red button to view details of the ring set. 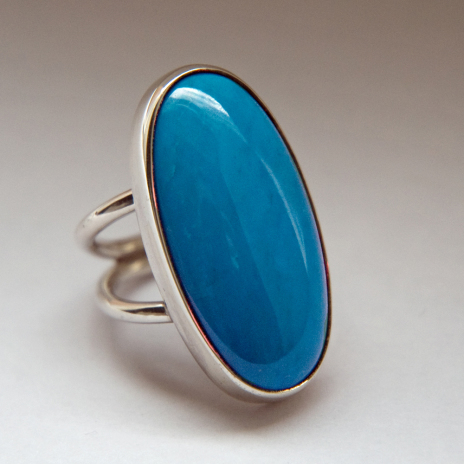 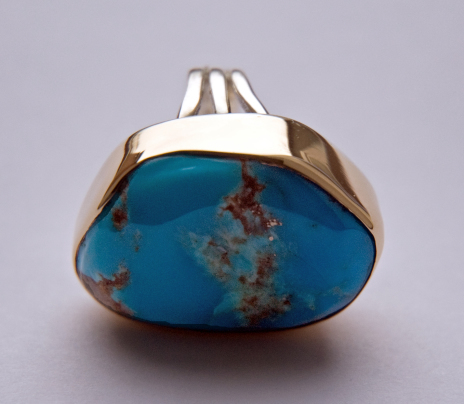 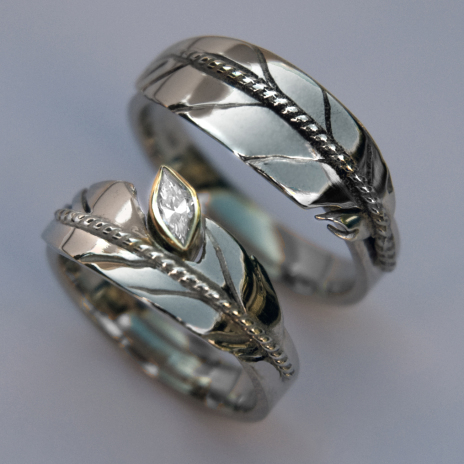 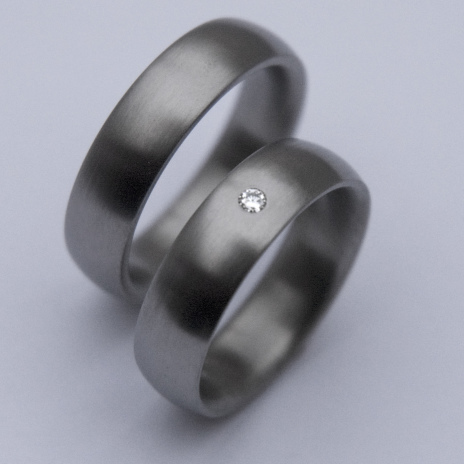 The gray button/buttons at the top of the page will give you access to the menus displaying Zhaawano's unique collections of Native American-inspired wedding rings, clan rings, and storyteller jewelry. 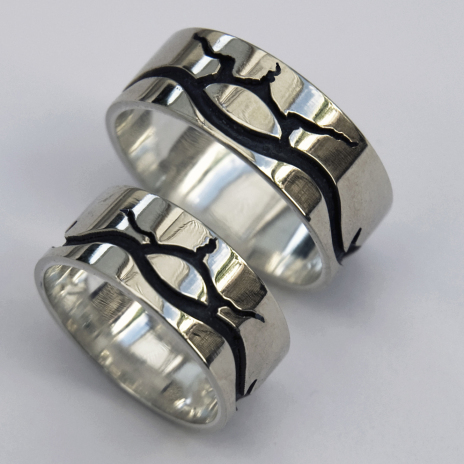 See also the slideshow to the right (above if you are using a cell/smart phone) and the beneath YouTube video for an impression of Zhaawano's collection of Seven Grandfather Teachings wedding rings. 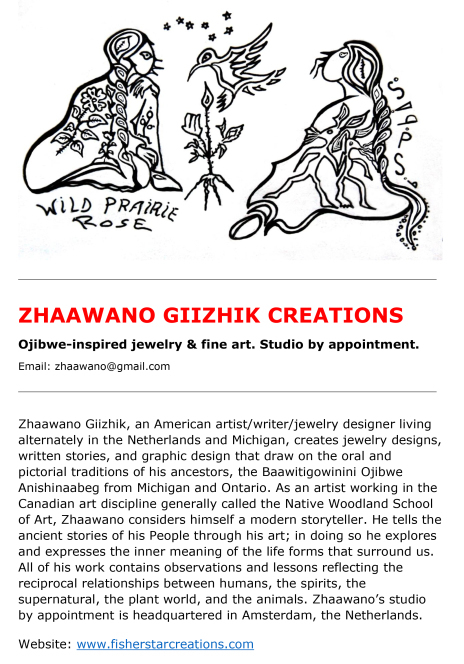 Click here, here and here to find out about the Native Woodland Medicine Painters tradition and the age-old Anishinaabe Midewiwin philosophy and worldview behind Zhaawano's work. 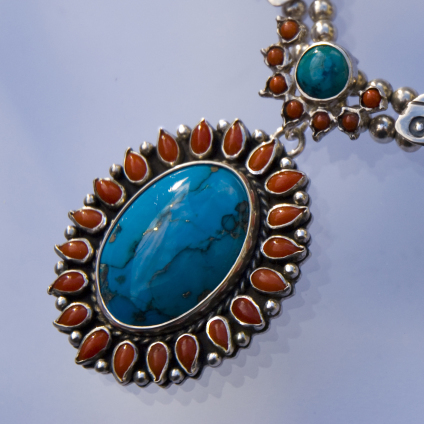 Click here to receive an email when our art blog is updated. 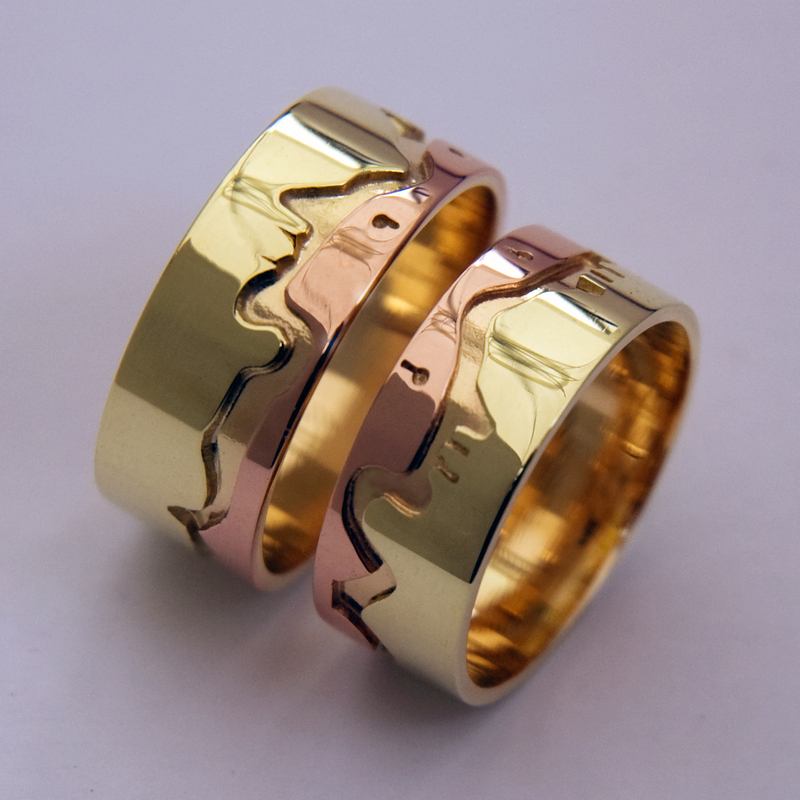 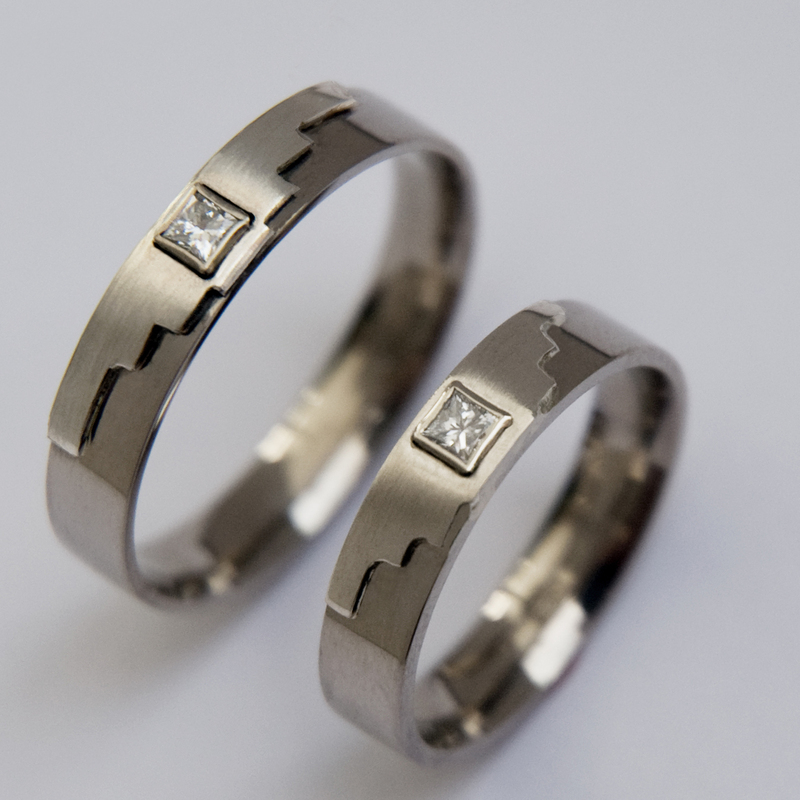 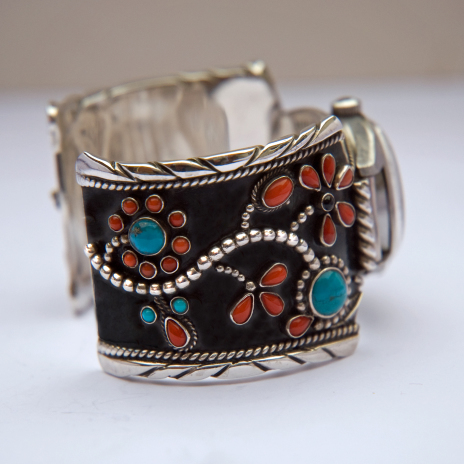 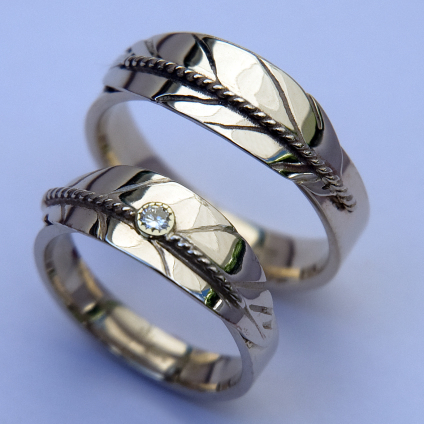 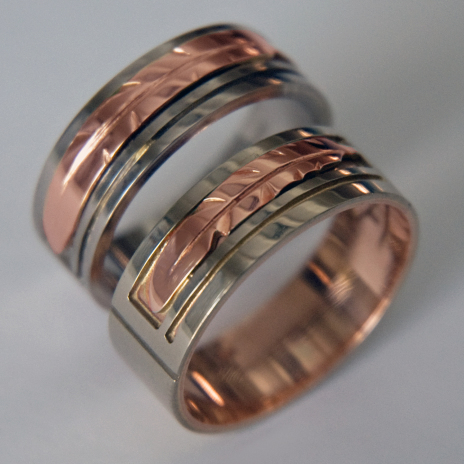 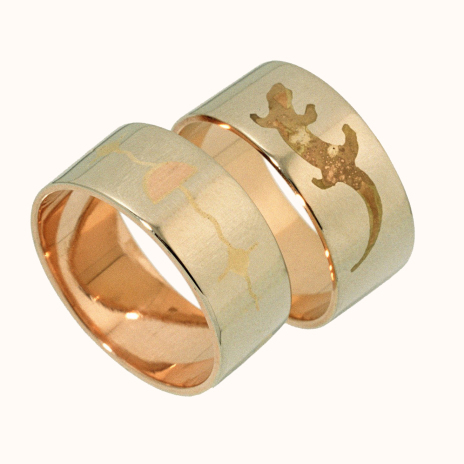 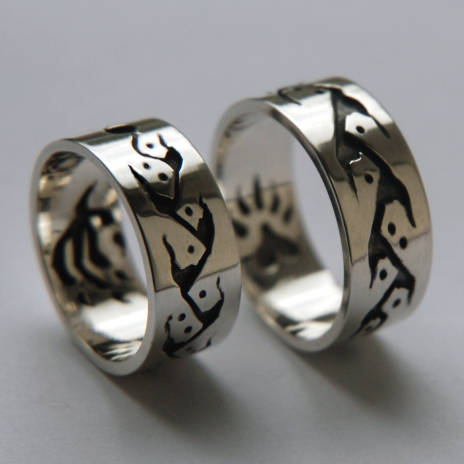 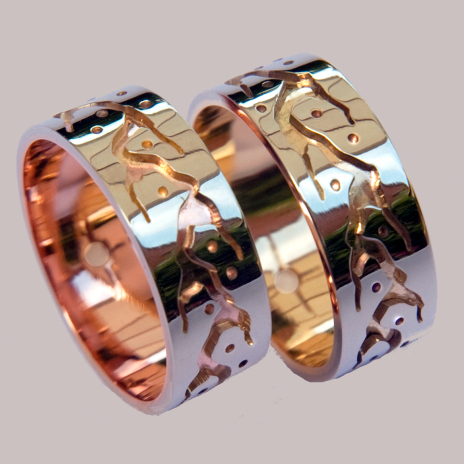 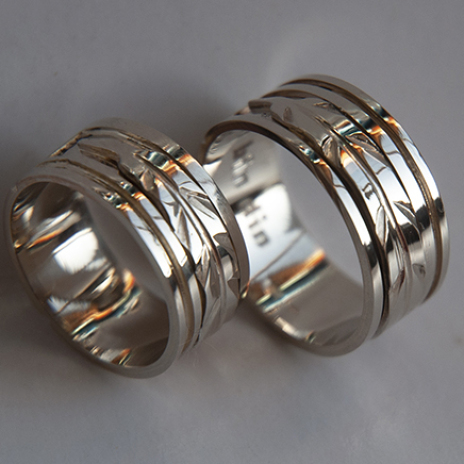 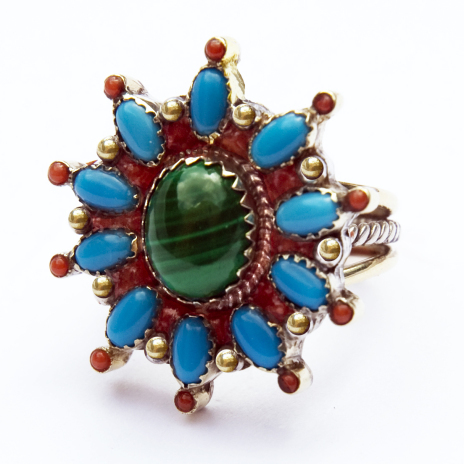 ZhaawanArt Fisher Star Creations is proud to offer you a great variety of one-of-a-kind, highly finished Native American-inspired wedding rings, wedding jewelry, storyteller jewelry, and clan rings, all made of Eco-friendly gold, silver, platinum, and various other metals. 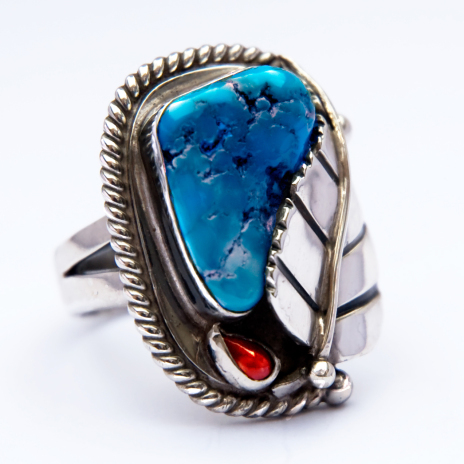 Throughout the years Woodland Art jeweler Zhaawano, who usually handcrafts his talking pieces from materials like 14 or 18K gold, sterling silver, platinum, palladium, zirconium, titanium, steel, and precious stones, developed a distinctly personal style, drawing on traditional Native American silver and goldsmithing techniques as well as on Ojibwe (Anishinaabe) form and symbol, yet adding his own contemporary sense of color and design. 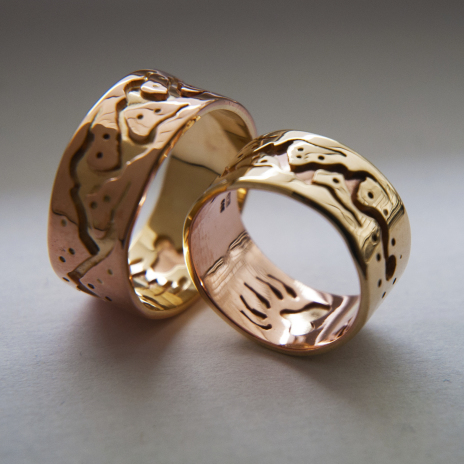 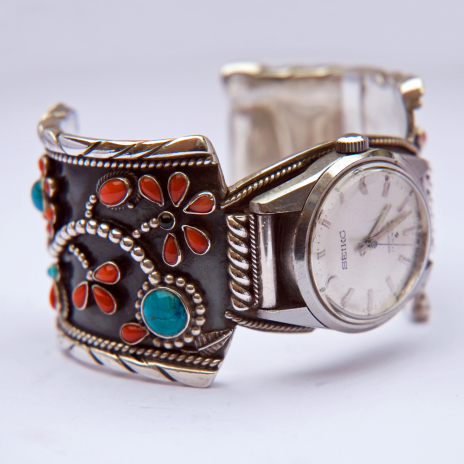 Each and every piece, designed and made by hand with a special prayer, tells a unique story; every single project that leaves his workbench shows certain personal touches of his artistry, his individual style showing through the larger traditions. 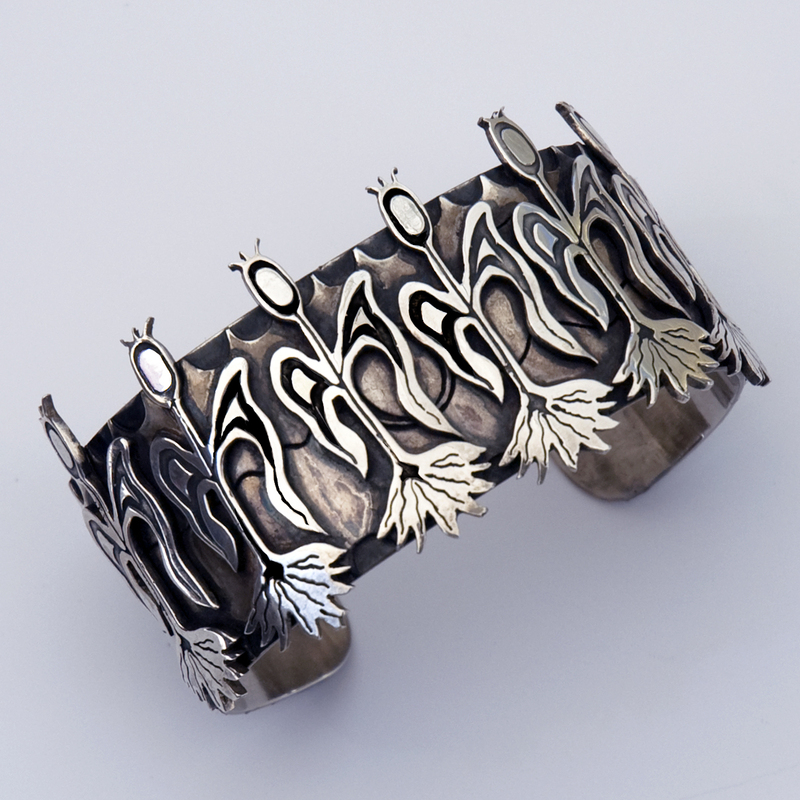 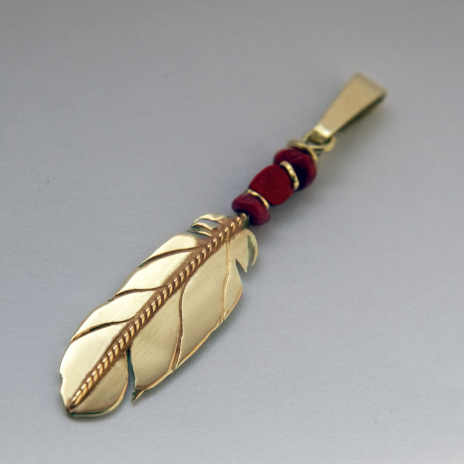 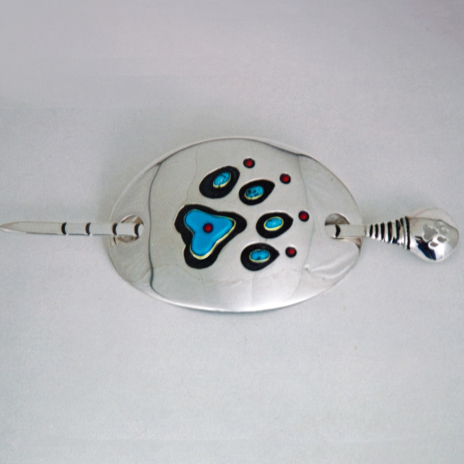 Being a contemporary Native Woodland artist inspired by the past, Zhaawano looks to the traditional symbols of the Anishinaabe Peoples as a foundation of a great variety of jewelry designs, poetry, and written stories. 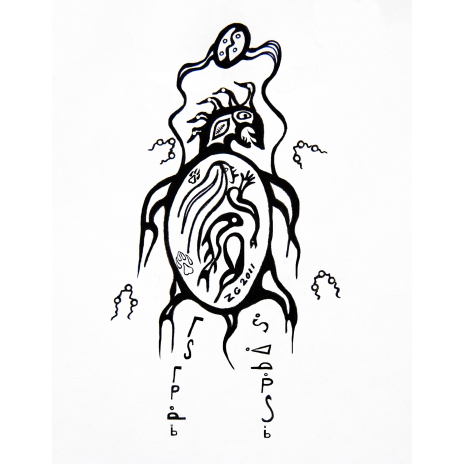 By using ‘‘spirit memory,’’ the remembrance of ancestral knowledge, Zhaawano seeks to re-introduce through his works of art and stories (and, on occasion, through the works of of kindred artists) the ancient world view of his People and channel it into the contemporary consciousness. In other words, he uses his skills and acuteness to find artistic ways to translate the cultural expressions of yesterday into the language of today, and render them into contemporary imagery that captivates the minds, opens up the hearts, and fires the imagination of everyone who lays eyes on it. 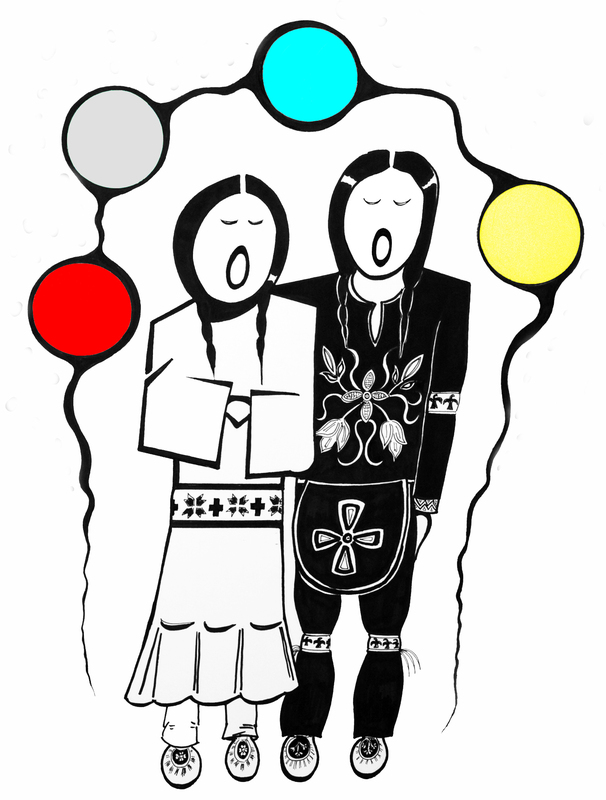 This art project, or creative collaboration of kindred spirits, is called "Native Spirit of the Fisher Star." 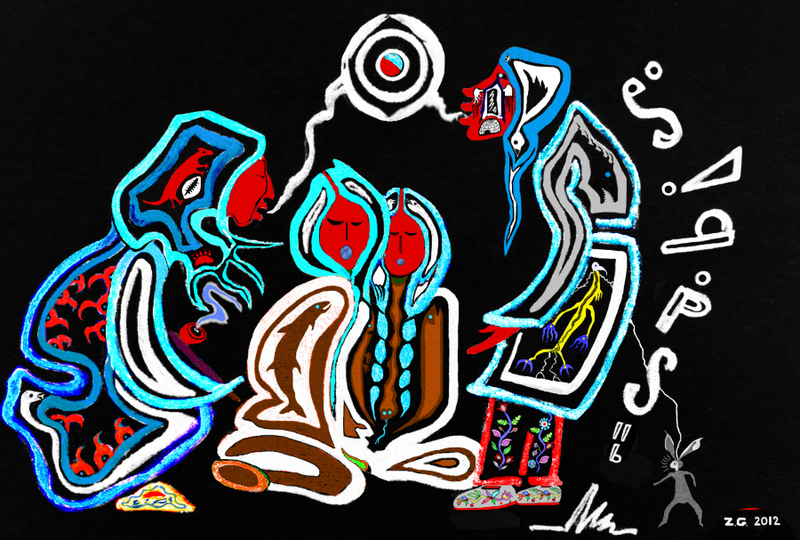 Native Spirit of the Fisher Star was initiated by Zhaawano in the hope to be able to help his People make aware of, and give them a sense of pride in, their culture and the lifeways of the ancestors - and, most important of all, to help them regain a quiet and benign sense of pride in themselves and make them aware of all that they can accomplish in the here and now. 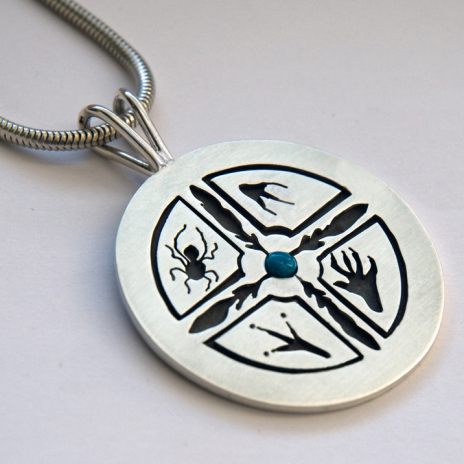 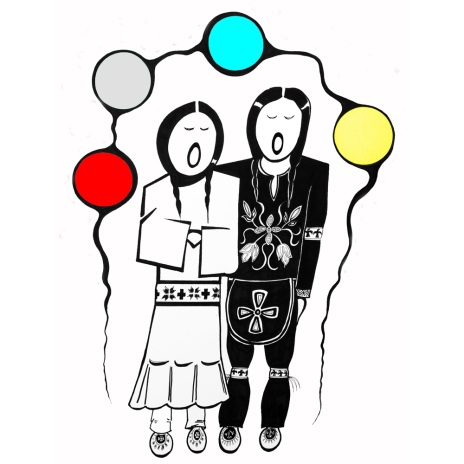 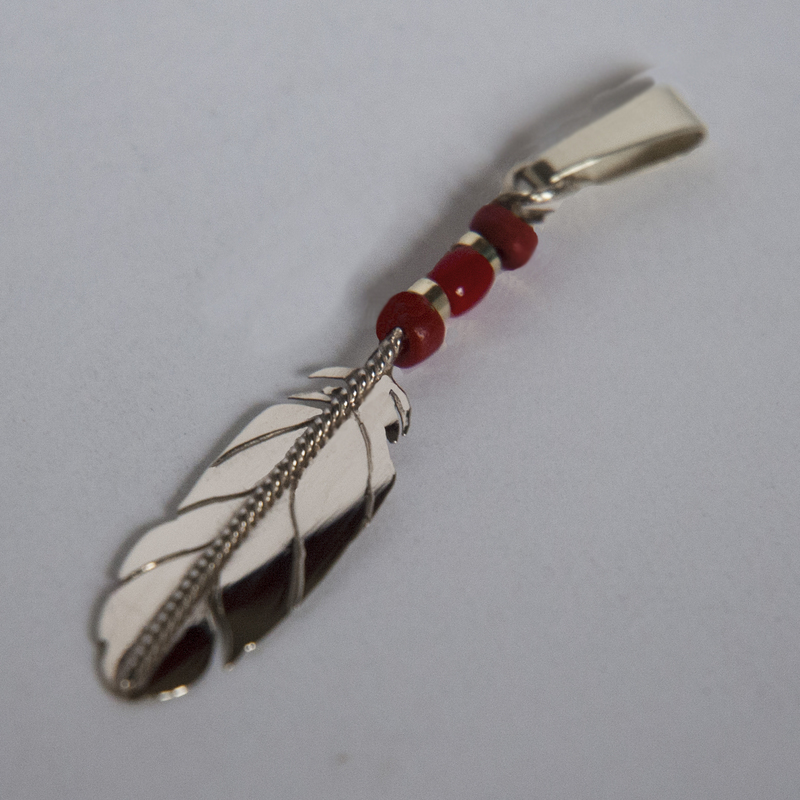 Learn more about the Seven Grandfather Teachings of the Anishinaabe Midewiwin that provide a unique theme to my jewelry, wedding & clan rings, and written stories.